Sure, weekends in the city offer plenty of great activities (boozy brunch and more boozy brunch, followed by six hours of The O.C. on Hulu back at your apartment), but it's high time you stepped outside of your regular weekend routine -- especially now that it's getting warm out. Make your weekend adventures exciting again with these 10 new escapes -- from a tipi hotel to a farm-to-bottle distillery -- that are all within two hours of the city. Brooklyn’s beloved open-air food and flea festival is launching a new weekly market in Kingston. Beginning August 6th, top chefs, craft brewers, and artisans from the Hudson Valley, upstate, and NYC will gather along 10 waterfront acres at the historic Hutton Brickyards. 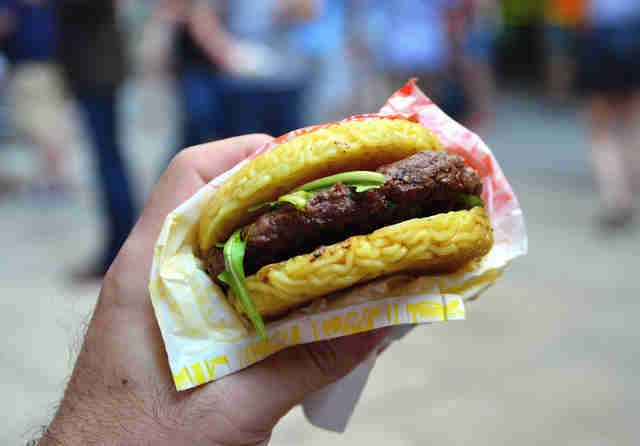 Smorgasburg vendors will include Outdated Café from Kingston, Raven & Boar from East Chatham, and Ramen Burger from Brooklyn. How to get there: Drive an hour and 47 minutes or take Adirondack Trailways from Port Authority to the Kingston Bus Terminal. Instead of starting yet another summer in the Hamptons, discover one of the last few remaining under-the-radar towns on Long Island. Book a romantic retreat at the brand new Stony Brookside Bed & Bike Inn, opening June 1st with complimentary gourmet breakfast, road bikes, and rustic chic rooms (from $115/midweek and $145/weekend). Innkeepers Elyse and Marty offer two-wheeled tours of Stony Brook as well as shuttle service out to Greenport and Shelter Island for cyclists interested in getting an insider’s guide to the North Fork. 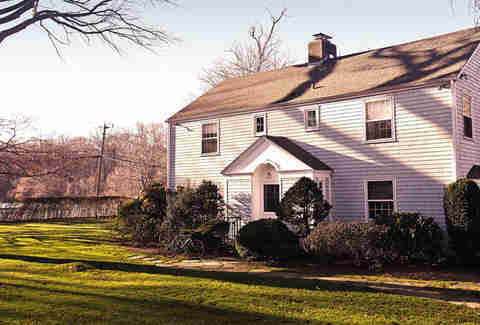 How to get there: Drive an hour or take LIRR to the Stony Brook station. Because you’ll finally get good at surfing -- and make the most of your time at the beach -- if you’re riding a wave on a board you handcrafted yourself. Maine-based Grain Surfboards has just opened a permanent workshop in Amagansett, where anyone can build a one-of-a-kind board made from sustainably grown cedar. In addition to the beautiful board you’ll take home, three-day classes include home-cooked breakfast, lunch, and secret tips on the best local surf breaks. How to get there: Take the car or ride LIRR two hours and 50 minutes from Penn Station to Amagansett. 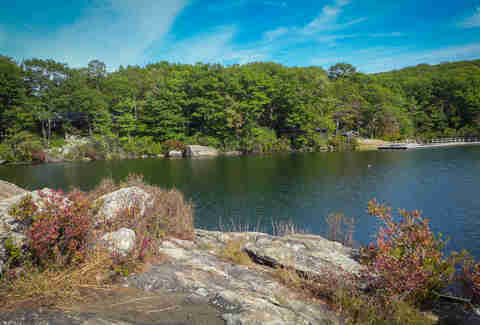 New York’s second largest state park is getting a major upgrade this July, when the Appalachian Mountain Club’s Harriman Outdoor Center opens near the banks of 64-acre Breakneck Pond. An idyllic basecamp for a weekend of adventure filled with hiking, paddling and, of course, s’mores, the center will offer cabins (from $96/night) tent platforms and three-sided shelters, as well as kayaks, canoes, a dining hall, and guided programs. How to get there: Drive 47 minutes or take NJ Transit from Penn Station to Tuxedo Station, where an AMC shuttle will bring travelers to the park. This spring, consider basking poolside atop Time Nyack, far from the city’s cramped rooftops and overhyped swim spots. 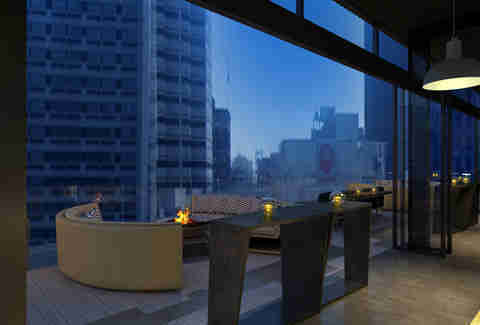 Opening in May, the 133-room hotel will breathe new life into your predictable weekend, just like it did the four-story former factory, which now offers stylish loft accommodations, Hudson River views, BV’s Grill, and cool packages like Time to Wine Down (from $239/night) that include a bottle of wine from Brotherhood Winery, a cheese board, and transportation to the winery for a tour and tasting. While in Nyack, visit the Edward Hopper House, hike Hook Mountain, and devour a maple bacon donut at Gypsy Donut. 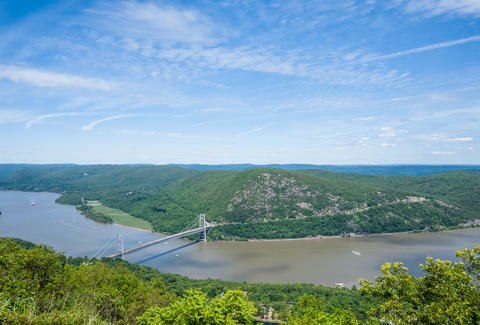 How to get there: Drive 30 minutes or ride Metro-North to Tarrytown, where the hotel shuttle can take you to the property 15 minutes away. Start this boozy adventure with a stroll across the longest elevated pedestrian bridge in the world. 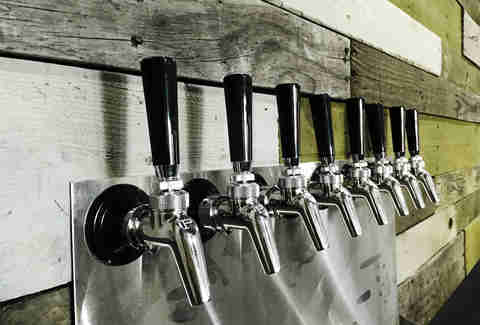 Situated right next to the Walkway Over the Hudson, the new taproom and craft brewery opens this spring with IPAs, sours, stouts, and Belgians along with locally sourced dry meats, cheeses, and other nibbles. Housed within a historic 7,500sqft warehouse, Hudson Ale Works will also offer hiker-friendly growlers for you to take home -- or into nearby Minnewaska State Park. How to get there: Drive an hour and 30 minutes or take Metro-North’s Hudson Line from Grand Central to Poughkeepsie, then promenade (or bike) over the Walkway Over the Hudson. Making the most of an artsy-fartsy weekend in Philly just got a helluva lot more fun thanks to newcomer The Logan (from $274/weekday and $290/weekend). Its Urban Farmer steakhouse and soon-to-open rooftop Assembly Lounge are the perfect way to close out a day of art doping at nearby cultural hot spots like the Rodin Museum, Barnes Foundation, and the Philadelphia Museum of Art. Break up all that gallery walking with a two-wheeled jaunt around town on the city’s new Indego bike share system; two stations, Free Library of Philadelphia and 21st and Winter at the Franklin Institute, are within a five minute walk from the hotel. How to get there: Drive one hour and 45 minutes or take Amtrak from Penn Station to 30th St Station. NYC may have beer gardens, but none quite like this. Starting in early June, thirsty travelers should head to the 3,000sqft SkyGarten to enjoy a local pint of Double Nickel pilsner or Schöfferhofer Grapefruit Weizen alongside spectacular but possibly acrophobia-inducing views from the 51st floor of one of Philadelphia's tallest buildings. While every other New Yorker has the same idea to drink in a warm summer day from a bar’s itty-bitty urban backyard, you’ll be sipping a cocktail like A Daydream It Would Seem at the state’s coolest new farm-to-bottle distillery, where there’s live music on weekends and a new farmers market. 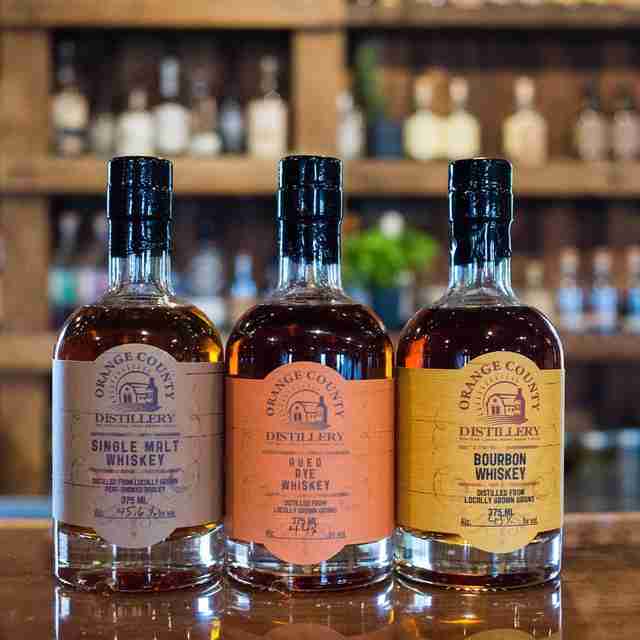 Founders John Glebocki and Bryan Ensall have turned a dilapidated 100-year-old tractor barn into an inspiring alfresco watering hole that produces award-winning bourbon, rye, and honey whiskey made from scratch. Distance from NYC: 66 miles; one-hour drive. How to get there: Take the Palisades Interstate Parkway to New Hampton. Few five-star hotels on the planet could compete with this kind of tranquility. 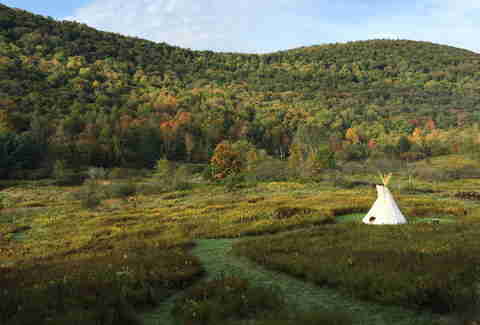 Soft opening this spring on five acres of pure wild outdoor bliss at 1,900ft of elevation, the Blue Jay Tipi (from $135/night) sits in a valley surrounded by wide-open fields and rolling hills, which means it’s just you, a wood-fired cedar hot tub, and a rarely seen starry night. Your tipi reservation comes with other amenities like a wood-burning stove, queen-size bed, a hammock, drinking water, candles, a headlamp, and an axe and hatchet for splitting wood (should you need more than what’s already provided). Book your stay before more tipis pop up this summer and don’t miss a travel-worthy meal at nearby Brushland Eating House, one of the 13 best restaurants in NY outside NYC. How to get there: Drive roughly two hours to the Blue Jay Tipi, located one mile outside of Bovina. Lauren Matison is a New York-based writer and the founder of offMetro.com who dreams of a summer spent between tipis, trailheads and two wheels. Follow Lauren on Twitter and Instagram.